Hello everyone! Today is a special day for Jimmy Buffett fans! I first heard the song "Cheeseburger in Paradise" while listening to my roommate's Jimmy Buffett cd. I can't remember much more of that cd because I think I would just put this one on repeat. It's so totally ridiculous that it's impossible not to love! I've been wanting to do this for a while now and when I saw that The Lacquer Legion's June nail art prompt was "On Holiday", I knew it was the perfect fit! One of the awesome perks of having an Instagram account now, is all of the IG-only contests I get to participate in! One such contest was held by @anonymouslacquer to help name her new tribute to Hello Kitty nail polish. If you've been following me for very long you will know how I feel about nail polish names. I'm pretty opinionated about them- they need to be good! So of course I had to jump on the opportunity to come up with something inspired. And guess what... my name won! As if naming a polish wasn't a prize in and of itself (I mean, it's pretty cool, right? ), I was sent my very own bottle of You Had Me At Hello Kitty! A big congrats to Melody J., the Nail Polish Society Now on Instagram Giveaway winner!! She has been contacted and I will be sending out the prize soon. Thank you all who participated! Don't despair that you didn't win, good things are still to come. I have my 1 year blogiversary next month and will be doing another giveaway. Besides that, I have some exciting things on the horizon, so stay tuned. I'm sure you will enjoy what I have in store! Hello ladies! I used these two polishes, OPI Don't Bossa Nova Me Around and love, charlotte xo (neon peach) together in my New Kids On the Block Party nails and loooved the combination. I've been itching to try them together again and this is what I came up with. It was super simple and easy, and I love the finished result. Enjoy! As soon as I saw swatches of Emerald Envy, I needed it. Most of the time when I see a polish that I just have to have, it goes on my wishlist. Then it usually stays there for way too long. This time I didn't hesitate. I went straight to the Renaissance Cosmetics website and bought that sucker! Hello ladies! Today I have a really lovely polish for you, Formula X Nova from their Celestials collection. You haven't seen a whole lot of textured polishes on the blog, I think this may only be the third. The others are here and here. Textured polishes have slowly grown on me. The scratchy tips aren't the best feeling, but not that horrible either. To be perfectly honest, the main reason I haven't been motivated to buy more is that they just don't photograph well. Would you forgive me if I say I think they look ugly in photos? Hey, I'm just saying what we're all thinking. This weekend my family and I had a fun time at the annual Highland Games held here. The weather was perfect (it was strangely cold for the middle of June but eventually warmed up), so we were able to spend a few hours there. We listened to bagpipes, watched a dancing competition, my son battled a medieval knight, and did a little shopping too. Last year my husband picked up a kilt, a Douglas Clan tartan. This year we shopped to find a sporran to go with it. Of course I had to have nails appropriate for the festival, so this is what I came up with. Happy Friday ladies! Today I have a fabulous manicure that I've been wanting to try for ages! I don't know what was holding me back, but I finally got my motivation after seeing this mani on All Lacquered Up. I loved it so much, I just couldn't wait any more! I felt sad that it's been at least a year since I've worn OPI Flashbulb Fuchsia. Now that I've been breaking out the summer polishes, I figured it was time to revisit it. For a few years this has been one of my go-to pedicure shades. I'm assuming you have as strong of an aversion to photos of feet as I do. So I spared everyone and kept it on my fingers. The color is a vibrant fuchsia that flashes purple and has a subtle but visible blue shimmer. I remember the formula as being a little more smooth than it was. I think I may just need to add some polish thinner to my bottle. I love the in-your-face pop of color that I get from it. Remember my last post when I said that I was ready for bright, bold, and crazy nails? Well this is what I was talking about! I have been sucked into the 80's flashback current, and I'm just going with it. Bright colors make me happy, and wearing this mani was a blast! Suddenly this week, I am ready for summer. I may not be ready for the heat in the days ahead, but I've got a craving for barbecues (if you have a grill, please invite me over), watermelon, and ice cream. I'm ready for long days, warm nights, and not wearing a single pair of socks. Best of all, I am ready for summer nails! Bring on the bright colors and bold designs. GIVEAWAY!! Nail Polish Society Now On Instagram! 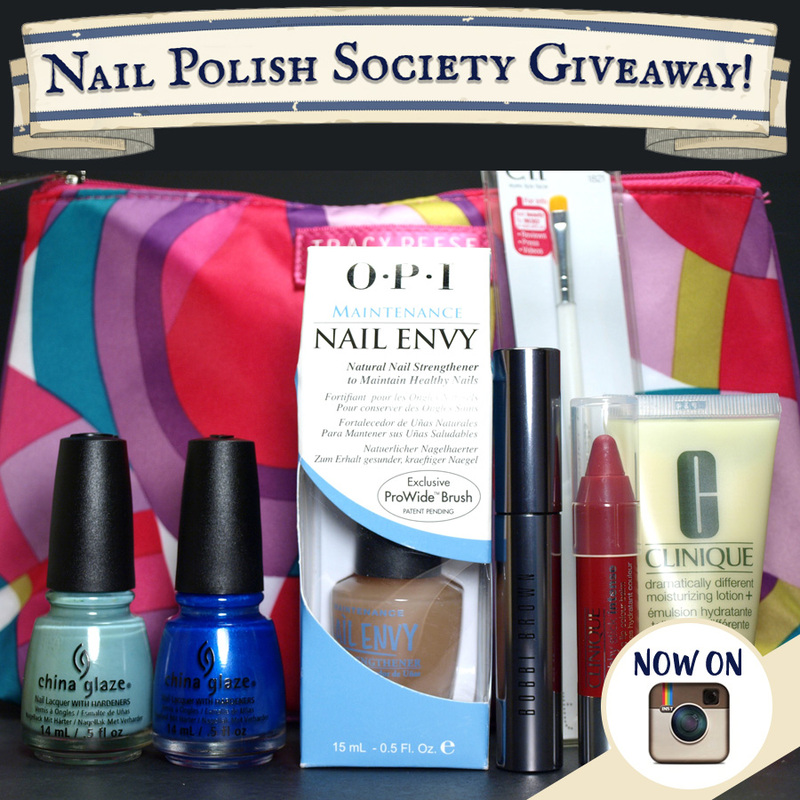 Nail Polish Society is now on Instagram, and I'm celebrating with a Giveaway! I think that's pretty self-explanatory, so why chit-chat about it? Let's get to the amazing prize! Happy Friday everyone! Some exciting news for me- Nail Polish Society is finally on Instagram! I'm still working on uploading photos and such. Feel free to start following me now because tomorrow I have a special surprise! Okay, I'll spoil the surprise... I'm having another giveaway! To celebrate finally getting on the IG bandwagon I've got one super duper prize. You won't want to miss it. Seriously. Blog Update: Disqus Commenting System, Tell Me What You Think! Hello beautiful readers! I have a big favor to ask of you. First, let me explain. I've just upgraded my blog's comment management system to Disqus. I've commented in many other blogs who use this system and I've found it really easy to use. I have, though, seen a few people say they don't like it for this reason or the other (I can't really remember what the issues were). Because your comments are SUPER important to me (how else do I know what you think? ), I am asking for your feedback. I know some of my readers have had issues using their mobile device accessing the basic blogger comment system that I've used until now. My biggest concern is that everyone has access to the new system. You DO need to create a Disqus profile to comment. I created my profile months ago and it was quick and painless. So my call to action is: PLEASE LEAVE A COMMENT! Tell me if it's working okay, if you like it, or with any other thoughts you'd like to add! If you are having issues and are not able to comment on this post, please visit my facebook page and leave your comment there. Thank you SO MUCH for your help! It is greatly appreciated. And thank you for being such a fabulous reader! p.s. For fellow bloggers: If you want to add Disqus to your blog, it was really easy. If you want any help with the process, I found this tutorial to be very helpful. Greetings! Random question today: How many of you lovely ladies feel the pressure to get ready for "bikini season"? I would say that in years past I have felt the pressure and the anxiety in the months leading up to summer, to whip myself into shape. I've at least put some effort into it, like eating a salad or two. This year I just feel like, "What's the point?" It's not so much about giving up, because I still like to be in shape. The fact of the matter is that I'm currently out of shape, and although I have plans (somewhere in the future) to rectify that, I'm not too concerned right now.